For news 2006, click here. 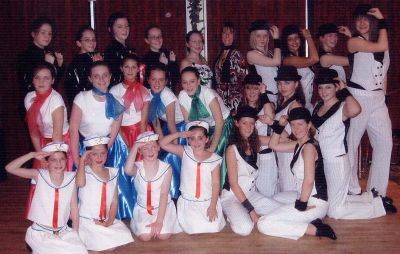 Tap dancers from the Avon Dance Academy. 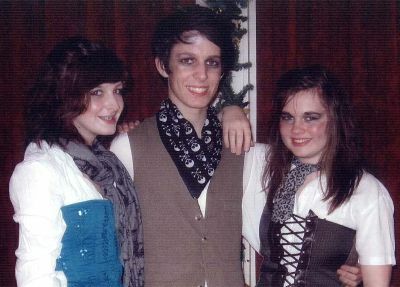 The magic element from Giles Chiplin assisted by Emma Chiplin on the left and Rebecca Livsey on the right. This year the club moved away from the traditional carol service. We were entertained by Janine Veal's Avon Dance Academy tap dancers and also with magic from Giles Chiplin and his fine assistants. The packed house enjoyed the entertainment and the collection realised £240 which will be doubled from our funds to provide water re-hydration tablets benefiting the third world. Lion President Alan was MC for the evening organised by Lion Russell Ford and Heather Hill, He thanked everyone for their support and help during his term and wished everyone a Merry Christmas and a Happy New Year. 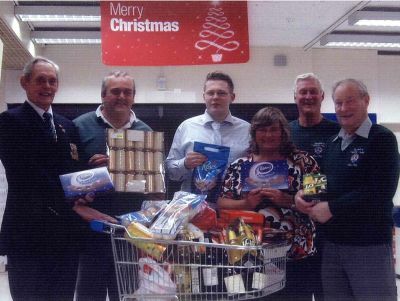 The annual Supermarket Draw was completed at RADCO, being drawn by General Manager, Non-Food, Mr Nathan Steer. Top prize, £250, was won by Gilliian Walter of Peasedown St John, with Debra Hudson of Paulton and Barry Rogers of Midsomer Norton winning the runner-up prizes of £25 each. Picture: Gillian showing her winnings: left to right: Lion President, Alan Denham, Derek Walter, General Manager, Nathan Steer, Gillian Walter, Lions Rex Gregory and Ray James. Paulton Platoon, (The Rifles) Somerset Army Cadets have been in existence for 25 years and celebrated their birthday recently. Under the guidance of Sergeant Major Keith Kennedy, the 15 cadets comprising both boys and girls, are a very active unit, entering competitions and training camps. August next year, they will be joined by 500 Somerset Cadets at Fremington Devon, for inter platoon competitions. 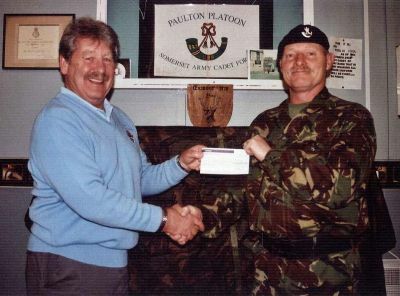 Picture: Welfare Chairman, Terry Porter, presenting cheque to Sergeant Major Keith Kennedy. Teachers and governors of St Mary's School, Timsbury have made a commitment to developing a creative and flexible curriculum that responds to pupils needs and is directly linked to real life experiences and events. Educational visits and visitors to the school play a substantial role in bringing the curriculum to life, but these can be expensive. To support the work of the school, the club has presented the school with a cheque for £205, which will be used t6o help fund a weeks residential visit to the Isle of Wight for 30 children next June. Accepting the cheque, Head teacher Sue Heal said "We are very grateful that the Lions have kindly agreed to support this residential visit. Pupils always look forward to this trip and for many children this is their first opportunity to spend a week away from their families. The cost of such ventures puts a significant strain on families with lower incomes and donations from organisations means that no child is excluded for financial reasons." 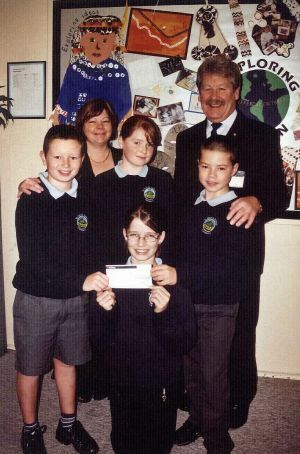 Picture: Pupils and Head teacher, Sue Heal, receiving cheque from Welfare Chairman, Terry Porter. The annual thanksgiving service was held at St Mary's Church, Chippenham. It was well attended and many clubs were represented. The service was led by the Reverend Bob Kenway, vicar of Calne and Blackland and an excellent address was delivered by the Reverend Roy Fowler, Minister of the Methodist Church in Calne. We though he had come to the wrong service when he started talking about buffalos, but he then went on to link love, service and Lionism in a most thought provoking way. DG Lion Ron read the Oath of Service, VDG Lion Surrinder read Wesley's exhortation and Lion Byron sang the solo, Panis Angelicus. 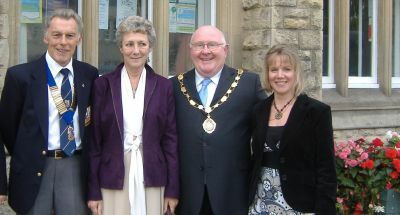 Councillor Rob Appleyard, Chair of Norton Radstock Council and Alison Appleyard. 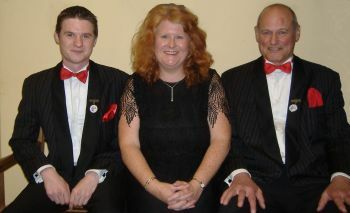 Picture Craig Kehoe, Deputy Music Director, Linda Corcoran, Director and David Proud, Chairman. The club enjoyed an informative evening, under the tutelage of Dennis Chedgy at the Museum. We also enjoyed the display of tapestries, currently being staged. 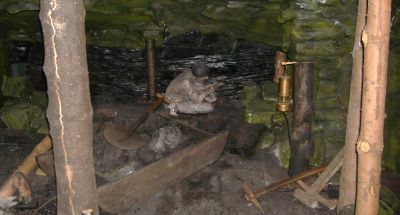 Pictures: One of the realistic displays of mining conditions in the Somerset coalfield, and the immaculately restored Co-op bakers cart. Excellent weather for this annual event. Lions Russell, Derek L, Alan and Phil K were raffling Teddies and Lions and flying the flag for Lions. Picture: Ben Parsons from Paulton with his winning. The club launched their first Duck Race with some 700 ducks taking part. We had good weather for the race and a good current flowing in the stream running along-side the High Street and at 11.00 hours these 700 ducks were released into the river at the back of the White Hart. It didn't take too long before the ducks appeared from under the culvert and at around 11.20 we had the first three ducks home. Pictures: Lion Dave releasing and retrieving the ducks. 11th August: Saltford Brass Mill, social visit. Members of the club visited Saltford Brass Mill and discovered some of the industrial heritage of the area that has largely been forgotten. Thanks due to Lion Derek Y for organising the visit. 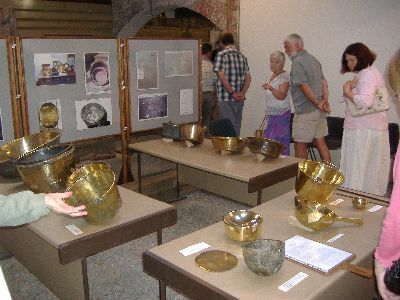 Photo: Club members and wives admiring some of the items that would have been typical of the mill during its operation. We were pleased to welcome Chris Banting to our meeting. Chris is a fund raiser for CLIC Sargent (Cancer and Leukaemia in Children). 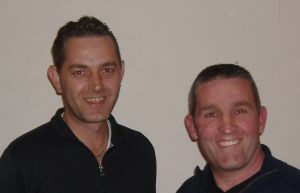 CLIC Sargent had been IPP Lion Dave's charity for his year of office, and he presented Chris with a cheque for £2,532. Chris spoke to the club about the work of CLIC. 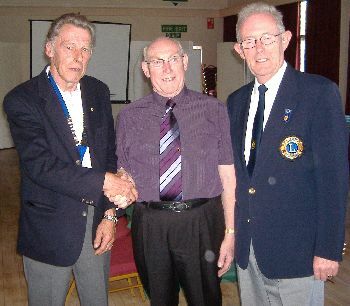 IPP Lion Dave especially thanked Lion Geoff and Lion Richard, for their organising of the Seniors Golf Tournament, and the Quizzes in High Littleton respectively. These were the major contributors to his charity fund. Photo: Lion Geoff, Chris Banting, IPP Lion Dave and Lion Richard. We were also pleased to welcome DG Lion Ron Clarke to our meeting. DG Lion Ron spoke to the club on various subjects, but especially on the flooding in Gloucester. He exchanged banners with Lion President Alan. 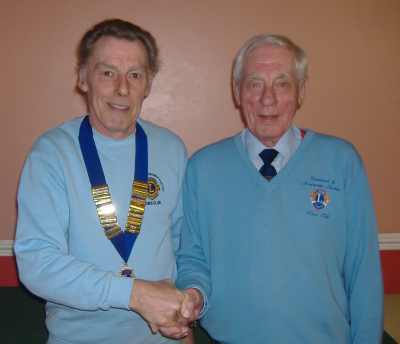 Photo: Lion President Alan (left) and DG Lion Ron. Prior to the first of many duck races we hope, members were in Midsomer Norton High Street, pre-selling ducks. Duks are selling at £1 each, and the first prize will be £50, with £30 and £20 for second and third places. Ducks start from the White Hart, and will race to the finishing line across the Somer, somewhere between the Library and Martins Newsagents. 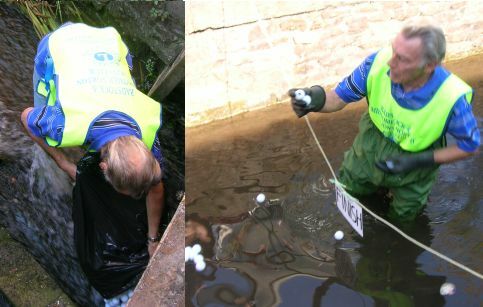 The duck race is being organised by Immediate Past President, Dave. Proceeds to the Gloucester Flood Relief Fund and RNLI. Picture: Lions Hilton, President Alan and Derek L, together with the Walker family, John, Pauline and baby George. Bath Lions hosted the farewell to our Youth Exchange Guests. 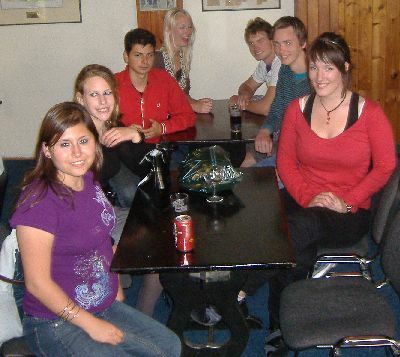 Radstock and Midsomer Norton club hosted two guests, Martha (front left) from Mexico and Silja (front right) from Finland. Mathilde (Denmark), Elvio (Italy), Levente (Hungary), Sophie (Austria) and Magnar (Norway) were hosted by other clubs in zone J. These young people then went to the Youth Camp at the University of Kent in Canterbury, organised by lions of MD105SE. Strawberry Jam, Clotted Cream, Fresh Scones, Tea and Coffee, 28 Musicians and Lions Ladies were the ingredients for our annual Garden Party. On a dry day in the beautiful garden of Sheila and Chris Jones, a very enjoyable afternoon was given to 80 enthusiastic seniors. Under the direction of Stewart Lewins, the Radstock and Midsomer Norton Silver Band played to a very high standard, a selection of popular music which everyone enjoyed. The Lions Ladies once again, we don't say for how many years, provided the refreshments. St John Ambulance were present, though thankfully, their expertise was not required. New President Alan Denham, thanked everyone for their attendance and especially thanked retiring Welfare Chairman, Lion Geoff Moore for his organisation of the event. Chris Jones was presented with a cheque for £250 towards the Jumbulance. This is a local charity that runs an annual coach trip for the elderly and infirm to the shrine at Lourdes in France. Next years Garden Party on 6th July will be organised by the incoming Welfare Chairman, Lion Terry Porter. 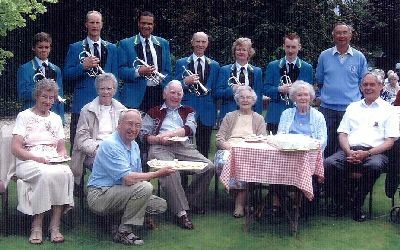 Local Senior Citizens with Lion President Alan on the right. Lion Russell Ford proving, he is still flexible of limb, in the front. A good evening and a good meal at Camely Lodge. Outgoing president Dave Ingram thanked all those who helped to make his year so successful. 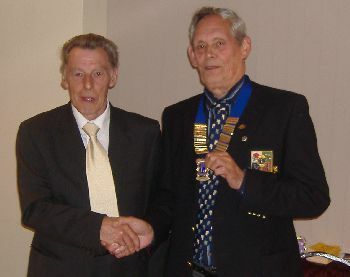 He passed the chain of office to Lion Alan, who introduced his committee members for the forthcoming year. Lion Alan said he had been congratulated by BaNES for the re-cycling that the club had managed this year. It is Lion Alan's fourth term as President. 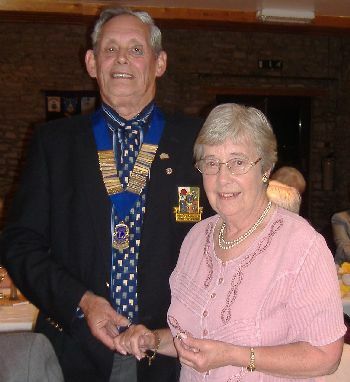 At Handover, Lion Alan badged up Mrs. Bernice O'Neill who had been elected an Honorary Lion at our last business meeting. 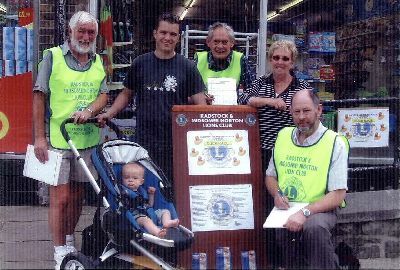 This means that Radstock and Midsomer Norton Lions is now a mixed club! We were pleased to welcome John Commons into the fellowship of Lions. John was sponsored by Lion Robert Briggs. The induction ceremony included the Lions Code of Ethics, read by Lion Russell, and the Purposes, read by Membership Chairman, Lion Alan. Photo: Lion President, Dave congratulating John and Lion Robert. 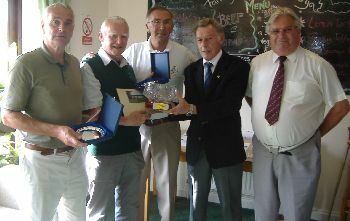 68 Golfers from as far as Minehead to the Cotswolds took part in out annual charity golf tournament. Playing for the Cameron Wood Trophy, C Standon and M Ashwin won the event with R Wright and C Robinson runners-up. The putting competition was won by R Thain. Enjoying fine weather, the event was organised by Lion Geoff Moore, raising approximately £2,000 for this year's charity, CLICK Sargent (Cancer and Leukaemia in Children). Grateful thanks are extended to Club president Dave Ingram, was assisted by Chris Banting, CLIC, in presenting the awards. CLIC helps children affected by cancer. Grateful thanks are expressed to the Farrington Golf Club for again hosting this event and to the golfers for supporting the tournament, to the companies and individuals for their hole sponsorship and to fellow Lions for their help in running the event. Left to right, the winners, C Standon and M Ashwin, Lion Geoff Moore, Lion President Dave and Chris Banting, CLIC Sargent area fundraiser. 2nd June: "Can" collection at Tesco: A number of Lions were to be seen outside Tesco on the Saturday, collecting for our Charity Funds. Many thanks to the Public who contributed to our funds. 17th - 20th May: Chateau Gontier Lions Twinning visit. 8 Lions from our twin club, Chateau Goniter, together with their wives and children, making a party of 22 in total, visited us for 3 days, arriving late Thursday. 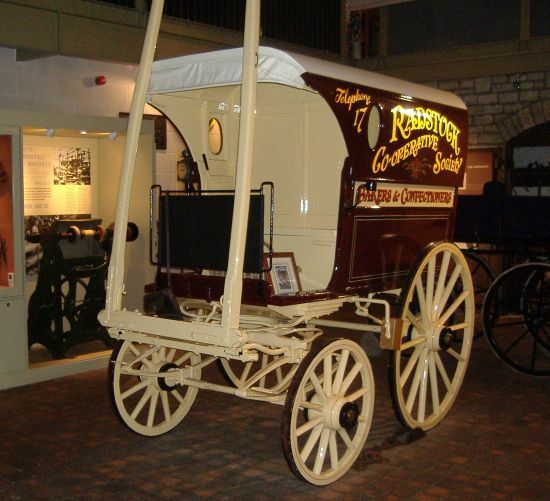 We met at the Fosseway, then, after a short rest, visited the Poachers Pocket for skittles and supper. An early start on Friday for an open top tour of Bath followed by a visit to the Roman Baths. 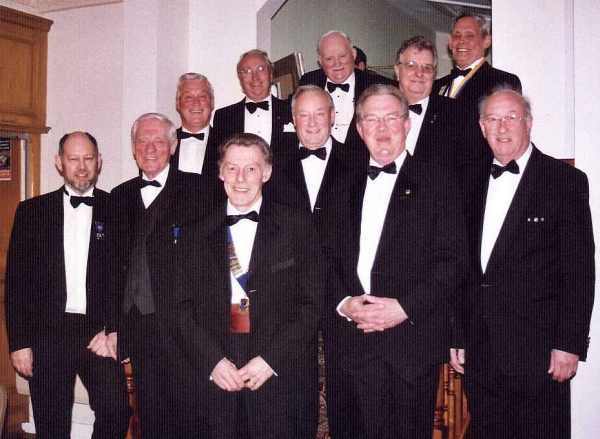 The traditional formal dinner was held in the evening at Cameley Lodge and was enjoyed by all. Gifts were exchanged between President Dave Ingram and President Philippe Gohier. Thank you to Paula and John for a wonderful dinner. Saturday, we visited Longleat with a picnic being held in the grounds, dodging the showers! A visit to Longleat would not be complete without a tour of the Safari Park. Saturday evening saw a Beetle Drive which our guests entered into with enthusiasm. Our guests departed Sunday morning, and we are looking forward to a return visit next year. 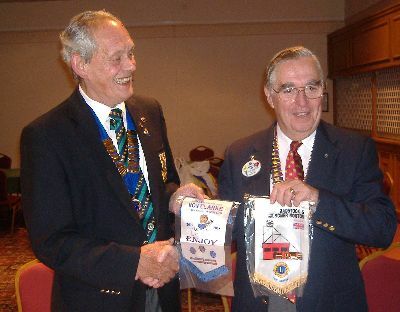 Both lions Clubs combined for a group photograph. 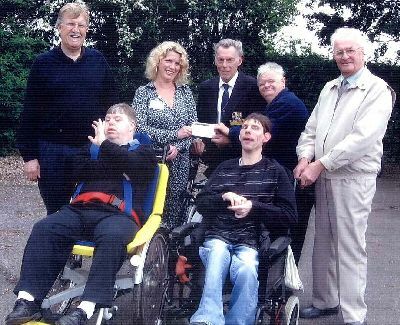 We contributed £750 towards the purchase of specially adapted bicycles. North East Somerset Day Services Manager Debbie Patten, and the physiotherapy team arranged a cycle day supported by Wise Wheels who supply bicycles which have been adapted for disabled people. In April, the team decided to start a campaign with the intention of raising £6,000. Clients, staff, families and friends took part in a sponsored ride using the adapted cycles. Debbie said that the project had really caught everybody's imagination and the target has been more than achieved, in fact it has been doubled. Together with donations from the Hartfield Trust, and a generous £5,000 from Oval Homes, the clubs donation has enabled the purchase of two of these bicycles. 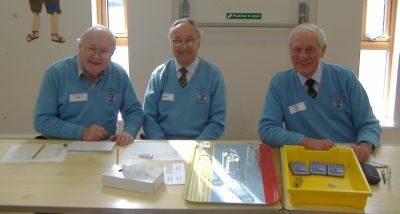 3 Lions from the club attended the convention which was held at the Rivera centre in Torquay. We were pleased to welcome Phil Kendon into the fellowship of Lions. 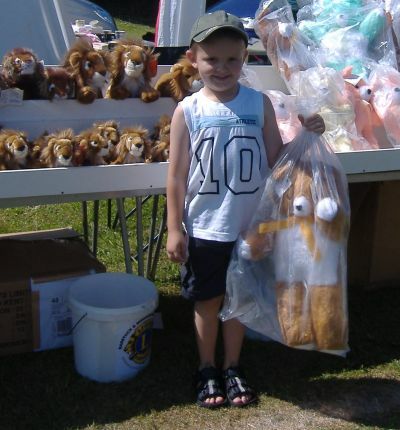 Phil was sponsored by Lion Rob. Phil increases our membership total to 29. 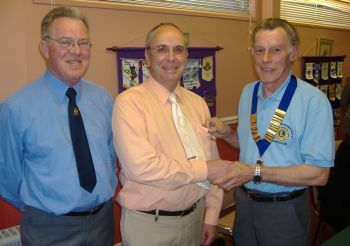 Photo: Lion Rob, new Lion Phil and Lion President, Dave attaching the Lions pin. For the second year running, the club have won the duck - groan. Severe training is being suggested to prevent this becoming a hat trick next year. After the first leg we were 16 down, and at the end of the competition we were a massive 52 down. Congratulations to Rotary. 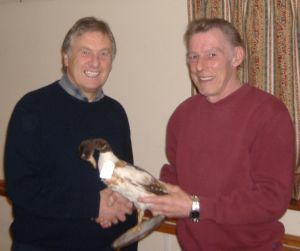 Photo: Rotary President, Roger Winsley, (left) congratulating Lion President Dave and passing him the duck. Mike Spiring gave us a talk on his forthcoming Death Valley Run to raise funds for a vital signs monitor for the Bristol Children's Hospital. We gave Mike our good wishes and have pledged £500 for this worthy cause. Photo: Nick Yelling (left), one of the support team, and Mike Spiring. Radstock and Midsomer Norton Lions Club sponsored and judged this competition at St.Nicholas, School, Radstock, on behalf of " Network Learning Bath "
A total of eight schools participated in the competition, three pupils from each school. The children selected the subject they wished to speak on, which varied from "The Simpsons " to "Cruelty to Children and Animals". The Lion Judges , Bob, Barry R. and Russell, agreed the Team from Westfield Primary School, were the winners. They were presented with National Book Tokens to the value of £30.00. and a Lions Certificate. Each child that entered the competition was also presented with a £5.00 National Book Token, and Lions Certificate. Lion Russell assisted in the presentation of the prizes, and also delivered a brief speech explaining the origin and purposes of the Lions. (With the help of notes provided by Lion Alan.) Lion Russell Ford. preparing to judge the competition. Lion Phil Hathway ably managed proceedings for the evening, starting by introducing our top table guests and then asking Lion Russell Ford to say grace. Lion President Dave Ingram proposed the Loyal toast and Lions Clubs international and went on to detail the clubs activities and achievements during the year. District Governor, Lion Adrian Hicks responded and thanked the club for their efforts. Vice President, Lion Alan Denham proposed the toast to our ladies and guests with a special welcome to Roger Winsley, Rotary President and his wife, Jayne. No evening would be complete without humour and laughter, and Friend of Lions and Midsomer Norton's Town Crier, Adrian Dando duly obliged. His personality shone through for some 20 minutes keeping the company in stitches. Secretary: Derek L, Bob, Rex, President: David, Russell, Ray, Geoff R, Rob, Social Chairman Derek Y, Membership Chairman: Alan, and Master of Ceremonies: Phil. Those who missed this concert, missed a treat. First time for this choir in Midsomer Norton. 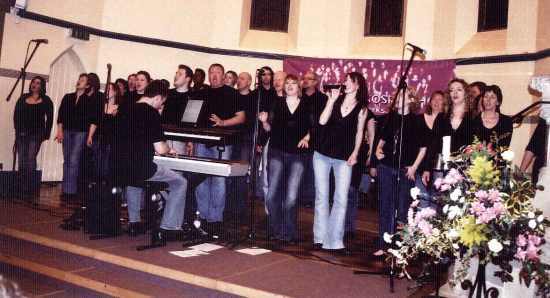 The choir are based in Bath and were ably led by their musical director, Tim King, assisted by Steve Jobbins on drums and Alastair Stewart on Bass. Choreography was by Tracy King. Only formed three years ago, VWGC performed an uplifting, powerful and inspiring rendition of their repertoire of gospel, soul and R & B music. Sometimes loud and sometimes quiet, the programme contained many well known pieces (too many to call) and concluded with the rousing and popular "Oh Happy Days". Soloists Tracy King and Catherine Foxwell performed well with their delightful singing and movement. Lion President Dave thanked the choir for the wonderful performance, St John Ambulance for their attendance and Lion Russell for his introduction and organ music, the Church Lasdies for their interval refreshments, Activities Chairman, Barry C for organising the event and lastly the audience for their attendance. For more information on the choir click here. 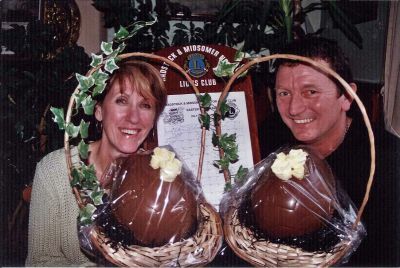 Our annual Easter Egg raffle continues to be very popular, with over 50 large eggs being distributed in the local area to clubs, pubs and hotels. Landlords of the White Hart in Midsomer Norton. 4 Lions from the club attended the convention which was held at the DeVere Hotel in Swindon. Report on the convention is on the District website, click here. Lion Bob was presented with his 25 year service chevron by Lion President Dave. Club members enjoyed a Beetle Drive, organised by Lions Rex and Rob. 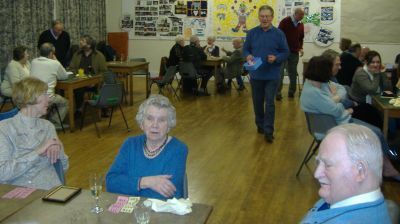 This enjoyable social event was also a fund raiser for twinning. Our French twin club, Chateau Gontier, will be visiting us in May. Club members visited the new children's Hospice at Wraxall. The Hospice will be opening in April of this year. 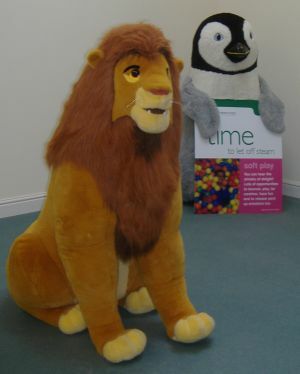 Lions from the south west have contributed towards the sensory rooms. This new hospice, along with the existing hospice at Little Bridge House, will give a much needed boost to capacity. For more information on Children's Hospice, click here. For information on Charlton farm, click here. 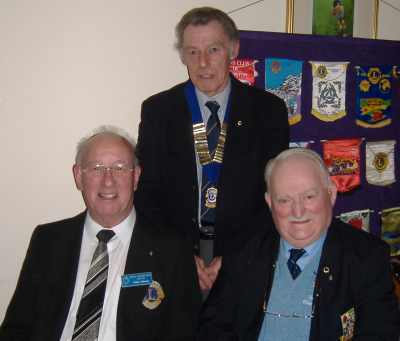 Lions Phil (left) and Geoff (right) were presented with their 30 year service chevrons by Lion President Dave (center). 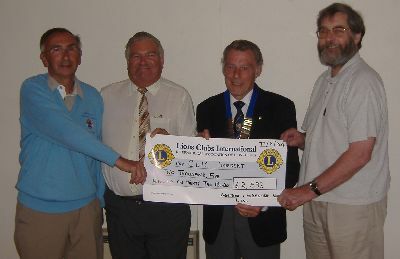 Both Lions Phil and Geoff are much valued charter members of the club. 3rd February: Diabetic Screening Clinic. 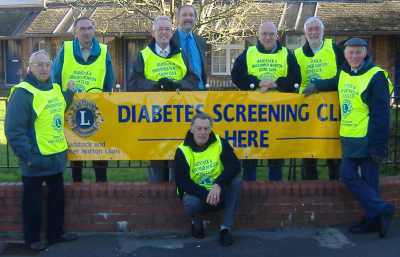 Lions were out in force in Midsomer Norton sheperding people into a Diabetic Screening Clinic run by Lloyds Chemist. 83 people were screened and 15 were referred for further tests. Lions thanked Manager, Trevor Phillips for allowing the club to assist in this way. Picture, Left to Right Lions Russell, Geoff and Robert, Lloyds Manager, Trevor Phillips, Lions Brian, Hilton and Bob. Lion President Dave is in the front. Club members enjoyed a social evening at Tuckers Grave. Sue, (Lion President Dave's wife) won the ladies' best skittler prize, while ex President Robert won the mans'. Sue proved it was not a fluke by also winning the post buffet killer competition! by the . Web design by Deltronic.